Mesothelioma: Do You Know the Symptoms? At first, mesothelioma will present with very few symptoms, making it extremely hard to detect. Once it reaches the later stages, the symptoms can mirror non-life threatening illnesses, which is why it is commonly misdiagnosed in patients each year. If you were exposed to asbestos, the chances of developing mesothelioma are much higher than a person that was not exposed. That being said, there are people in the United States that contract this rare form of cancer without any exposure. The symptoms you experience are often based on the stages of the disease and they are used to determine your prognosis. 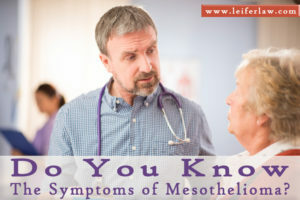 If you notice the symptoms of mesothelioma, see a doctor right away. Pleural Mesothelioma Symptoms – This is from of asbestos involves inhalingfibers. The fibers trap inside the lungs and create inflammation that later cause a thickening of the pleura layers. Some common symptoms include fluid buildup, shortness of breath, weight loss, dry cough and chest pain. Peritoneal Mesothelioma Symptoms – While it does share symptoms with the pleural type, such as unexplained weight loss, there are fewer cases of this type of mesothelioma, making it that much harder to diagnose. Some common symptoms include abdominal fluid, weight loss, appetite loss and epilepsy. Pericardial Mesothelioma Symptoms – This is arare form of this type of cancer. In fact, less than one percent of cases are diagnosed as this type. Symptoms include chest pain, irregular heartbeats, difficulty breathing, fluid buildup and pericardial bleeding. Metastatic Symptoms – Once mesothelioma develops and enters metastasis stage, people notice symptoms that include nerve issues, hemoptysis, damage to their throat, eye-related issues, and more. Unfortunately, mesothelioma can take years or even decades to develop, which is why most physicians do not realize a patient was exposed to asbestos or even consider mesothelioma as the diagnosis. Because the symptoms of mesothelioma are not unique and can be mistaken for other diseases and conditions, most patients are not diagnosed until they reach later stages of this cancer, such as stages three and four. A misdiagnosis of the rare mesothelioma cancers is the most common. But, when patients are proactive and seek treatment immediately after symptoms appear, they can lessen the risk of fatality and improve the chances chemotherapy will work for them. Did You Develop Mesothelioma from Asbestos? Mesothelioma from asbestos exposure is serious. At the Leifer Law Firm, we have helped numerous families with their mesothelioma claims and we can help you, too. Whether you were recently diagnosed or you lost a loved one to mesothelioma from asbestos exposure, please contact our law firm today. Mesothelioma is a very aggressive form of cancer and because it is easily misdiagnosed, it becomes so advanced that most patients do not receive the treatment they need. Please call our skilled Boca Raton mesothelioma lawyers today for a free consultation regarding your asbestos-exposure case so we can get you the compensation you deserve for treatment.